Remember all those Dads? Well here is my Father-in-Laws card.. Thanks for stopping in... Be ready theres way more to come today!! I hope!! What a great card for this color combo! Love the bright red truck and the tire tracks in the background make it so fun! Thanks for playing with us at Colour Me! What a great card. The truck stamp is so perfect. Great card for Father's Day!!! Thanks for joining us at Colour Me! Awesome Father's Day card!! Great image, wonderful coloring, and I love how you inked the edges! Fabulous CAS card, I love your take on the sketch. 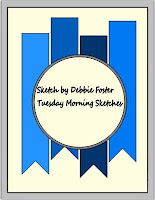 Thank you for playing along with us for Tuesday Morning Sketches.